Super fun! I love the cupcake-in-cone trend. Me too! The first time I ever heard about this idea was when my mom made a bunch of Santa Claus cone cupcakes for my preschool class haha. There are pictures somewhere. 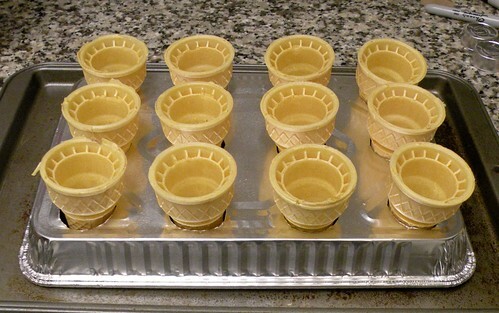 I made cupcakes in cones for a fete once and they sold out instantly! They’re so cute, people love them. Awesome! How did you transport them? Because I was trying to figure out how I could get them to people who I share my baked goods with but I couldn’t think of a way to prevent them from falling down. I’m pretty sure I rigged up a system with tin foil to transport them with! Wrapped around the base of the cones and then all wedged into a box. It wasn’t super stable but it worked. Interesting. I’ll have to try and finagle a solution for these some time in the future. Thank you! Yeah definitely try it!